This is a category of topic (question, problem). Definitional (analytic): A question is definitional, if an answer to the question is a definition. Examples of definitional topics include What is theory?, How should theory be defined? etc. 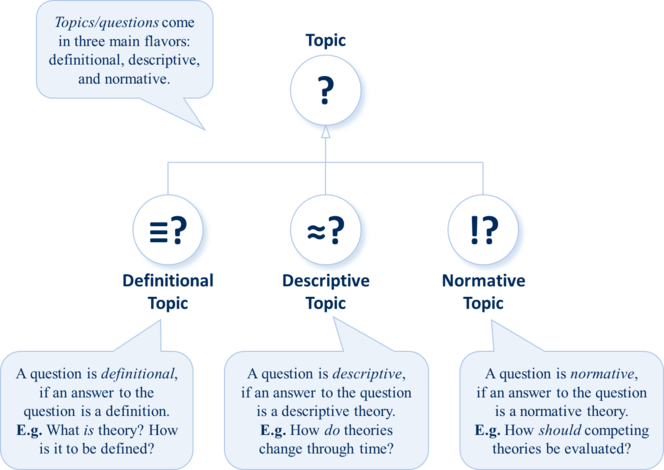 Descriptive (explanatory): A question is descriptive, if an answer to the question is a descriptive theory. Examples of descriptive topics include What is the mechanism of scientific change?, How do criteria of demarcation change through time?, Can there be unchangeable methods of theory assessment?, etc. Normative (prescriptive): A question is normative, if an answer to the question is a normative theory (i.e. an evaluation/prescription of a certain course of action). Examples of normative topics include How should we evaluate new theories?, How should a TSC be assessed? Here is a simplified class diagram for the sub-categories of topic. To add a new question/topic, do so under one of the sub-categories below. This page was last modified on 5 September 2016, at 04:55.